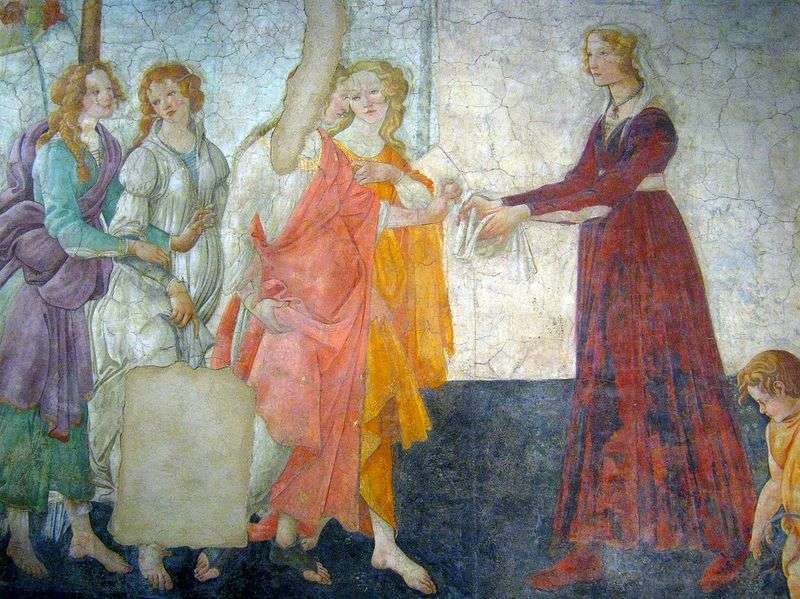 One of the surviving frescoes of Villa Marcelli portrays a group of four young women in ancient Roman apparel, approaching the young lady standing opposite them, and handing her their gifts. It is commonly believed that this is Venus and three graces, symbolizing chastity, beauty and love, but there is no evidence at this time. Venus plays a leading role in the second fresco. She hands her gift wrapped in a veil, a bride, next to which is cupid; in this context it is a hint of a marriage, in honor of which the mural is made. Venus is accompanied by three Graces. The background of the scene is also the garden. The symbolic gift received by the newlywed from Venus and her nymphs is the highest treasure of the soul, the virtues that define moral perfection, and which adorn the beautiful appearance of the lady. This composition is a kind of act of worshiping the ideal lady and a gallant wish for her. The light figures of Venus and Graces are delineated by a vibrating line, each bend of which responds to the shades of emotional experience transferred to the composition. Its exquisite beauty is enhanced by a color scheme, which includes a combination of golden-beige with a soft pink tinge and green with a gentle-purple. For the bride’s silhouette, straight and stern contours are more characteristic, her dress is dyed. The composition is based on the rhythm of the pair figures, separated from the earthly heroine of the action by a spatial solution. The images of Gracias are remarkable for their grace. It seems that their light airy attire swayed the air. But this mobility does not have a physical, but a celestial nature. A soft wave of hair falls on the shoulders, forming a golden-reddish halo around the head; The facial features are indicated by the same wavy contours as the general silhouette of the figures. The sinuous line flows around the figures, connecting them into harmonious harmonies. Description and meaning of the painting Fresco of Villa Macherly. A young woman accepts gifts from Venus and three graces by Sandro Botticelli.